The Cognacq-Jay Museum in Paris shows until 2 March 2014 the fan exhibition The Golden Age of Fans, from the Sun King to Marie-Antoinette. 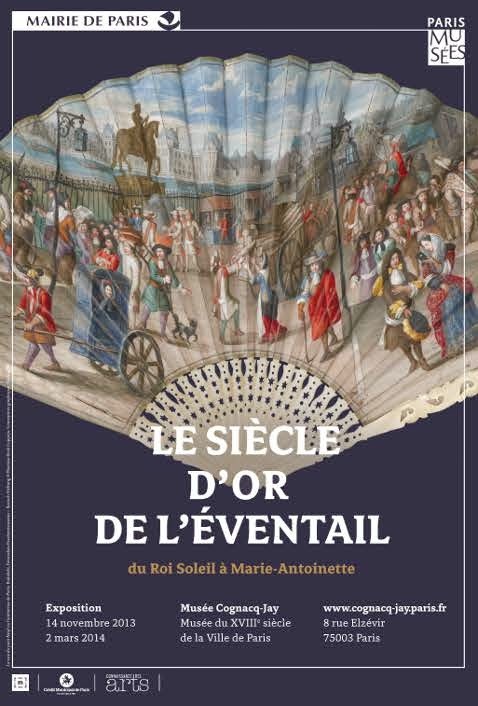 For all those that cannot go there, have a look at the short video that gives an overview of the exhibition with lovely views on 18th century Paris, amd an interview with the scientific curator, Georgina Letourmy-Bordier (in French). If you got the taste for 18th century fans, have a look at the fan auction that will take place on 12 February 2014 at Drouot, at auctioneers Coutau-Bégarie. One particularly beautiful fan of Versaille would very well fit into the Golden Age exhibition. You can see all lots of fans in the on-line catalogue.